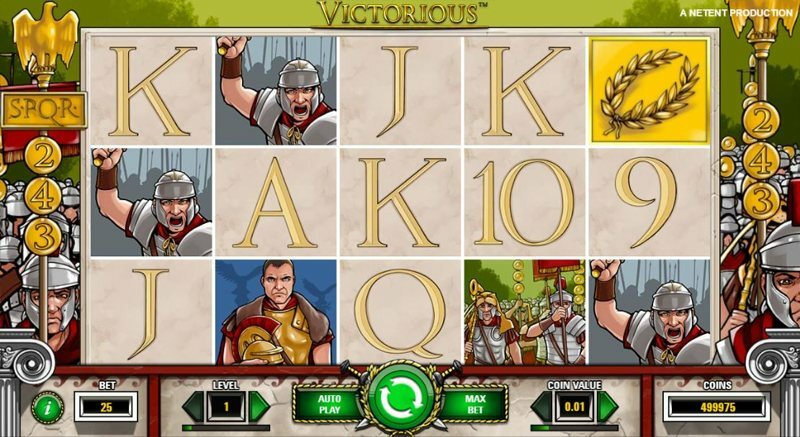 Victorious is a popular video slot from Net Entertainment, and the game features a unique Roman theme that has you guiding an army into battle – think you’re up for the challenge? Then Victorious could be one of the best video slots around for you. Now, unlike traditional battle, you’re not leading your troops to a near certain death simply fighting for land or survival – instead, you’re doing it for the money, and by taking on the slot, you’re putting yourself in a position to win a whopping jackpot of 125,000 coins – yes, that’s one of the reasons why Victorious is one of Net Entertainment’s most popular titles. Victorious is designed much like a classic old school video slot, and while the backdrop and reels are graced with fantastic Roman decor, the reels and symbols themselves are relatively basic, with little more going on than simply what looks to be a tile surface behind the symbols. The symbols on the reels include playing card denominations, which of course, are the lower paying symbols within the game, and you will also find game specific symbols – including a wreath, a king, a shield, and troops, dressed ready for battle, which act as the high-paying symbols. The first thing you’ll notice when you open up Victorious, is that unlike most of Net Entertainment’s video slots, the game doesn’t use a typical pay line structure – instead, it uses the 243-ways-to-win format that we’ve seen made famous by Microgaming, and this ensures that you don’t need to worry about specific pay lines – instead, simply landing one symbol on each reel guarantees a win, regardless of where it lands. Of course, the payouts are generally smaller, but, as it’s possible to get multiple pay lines through the same symbol, it all works out relatively, and most players love the 243-ways-to-win format simply because of the potential that it offers. Now, in order to trigger the free spins round – which is the sole bonus in Victorious – you’ll need to land three or more of the scatter symbols – these are the wreaths, and they’re bright yellow, so you can’t miss them. Once you land three or more, you will be awarded with 15 free spins. Land four of the scatter symbols and you’ll be awarded 20 free spins, while five gives you a generous 25 free spins. During the spins, the wild symbols from the main base game act as sticky wilds, and any time you land one, it will then stick in place for the remainder of the free spins. You will also see all your wins trebled, thanks to the 3X multiplier that becomes active during the bonus – this means even a relatively small win can be semi-decent, and it ensures that you have the best possible chance of winning big. It is also possible to retrigger the free spins, and in order to do this you’ll need to simply land three, four, or five of the scatter symbols within the bonus. You will then be awarded either 15, 20, or 25 free spins respectively; the same amount you get when entering the feature in the first place. It’s definitely not one of Net Entertainment’s most intuitively designed games, but Victorious is a long-time contender for one of the software providers most popular games, and while it is a relatively high variant game, if you are lucky enough to get the bonus round on a lucky day, you can take home a gigantic pay-day, thanks to the huge coin jackpot on offer.